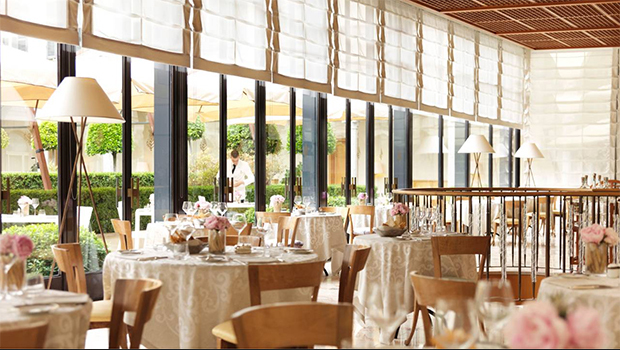 Four Seasons Milano is absolutely everything you would expect enchanting and magical Italy to be. Housed in what was once a 15th century convent, the Four Seasons Milano offers lucky guests the Italian experience of a lifetime, with history and art coming to life in the very walls and ethereal air of the hotel. With vaulted ceilings, hand-painted Italian murals, larger than life stone pillars and marble floors, guests step back in time, breathing in pure air adorned with the fresh scent of Milano blooms in the peaceful gardens. Though one of the hotel’s main attractions is its alluring history, Four Seasons spares nothing in ensuring that guests experience the utmost in Italian luxury and the most convenient modern amenities. With many rooms boasting floor to ceiling windows and billowing satin draperies, one can repose on one of several hand-crafted Italian sofa chairs or on the splendid king beds and not miss a moment of the tranquil courtyard garden view or of lovely Milano. The attention to details is spectacular here, whether it’s the custom loomed carpeting, designer Italian fabrics and Frette linens, European deep soaking tubs in marble bathrooms with heated marble floors and steam-resistant mirrors or the gorgeous fresh flowers in the suites, Four Seasons has outdone itself. Many suites have opulent four poster beds, hardwood floors and hand-carved ceiling artwork with crown molding trim while others offer soaring vaulted ceilings, fireplaces and private terraces with gardens. The extravagant Visconti Suite should not be missed, even if just for a peek, with its incredible vaulted wooden ceilings, whirlpool bath, marble fireplace, wood paneling and velvet furnishings. If guests can pry themselves away from this most hauntingly exquisite hotel, they will be happy to know that the best of Milano is at their doorstep. Centrally located in Milano’s shopping and business district on prestigious Via Gesu, nearly everything is within walking distance from the hotel. World famous sites such as the 700 year old Duomo Cathedral (connected to famed Opera House La Scala) and Galleria Vittorio Emanuele (a 19th Century mall with many shops and restaurants) are just a few minutes’ walk away. Numerous art galleries, restaurants, museums and theatres are all within walking distance so guests can immerse in a truly colloquial Milano experience. Four Seasons hosts its own set of brilliant dining options including Il Teatro, La Veranda and Il Foyer, each offering unparalleled quality in both cuisine and service. Il Teatro has a strong focus on Italian fare though its post theatre menu ventures into unique fusions with delectable selections such as Pan Seared Sea Bass with Fennel Puree in a tangy Citrus Glaze and Mango & Pineapple Carpaccio with Ginger Lemongrass Syrup and Coffee Gelato. All the restaurants are heavily committed to using nothing but the freshest ingredients with classic Italian flavors and techniques. The Il Foyer Lounge is absolutely stunning, housed where the convent’s church existed more than half a millennium ago, offering light snacks, desserts and nightly live entertainment. Here, the staff goes out of their way to make guests feel both at home and royally pampered. Enough cannot be said about the Four Seasons Milano. One can only experience the magical splendor in reality.